March 15 was a dark day, not only for New Zealand but for everywhere else around the globe. Terror attacks were initiated at two mosques located in Christchurch. As an aftermath, the mass shootings received criticisms from the netizens through Twitter. 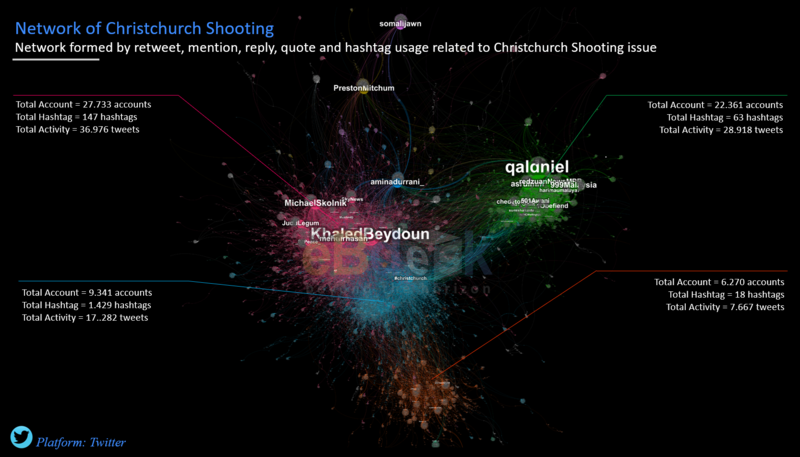 Looking at the network of “Christchurch shooting” in Twitter, it can be divided into four major clusters. Yet, all of them shared the similarity in condemning the terror attack. The biggest cluster is the pink group with influencers @KhaledBeydoun, @MichaelSkolnik, @JuddLegum and @mehdirhasan. This group associate the tragedy with US president Donald Trump. Back in 2016 during his presidential campaign, Trump shared a fake story of General John Pershing. He said that the general executed 49 Muslim terrorists with bullets dipped in pig’s blood. The resurface of Trump’s past statement led to criticisms towards the US president. Next is the blue group. This cluster was brought together with the hashtag usage of #christchurh. Twitter users from this cluster tweeted their sympathy for the victims of the tragedy. Additionally, they also shared the news of New Zealand Prime Minister Jacinda Arden signing a National Condolence Book to remember the victims. Meanwhile, the green cluster is discussing on the matter of New Zealand approach in implementing stricter gun control. Consequently, New Zealand government will tighten the nation gun law, particularly banning military-style automatic-weapon. At the same time, some users posted sarcastic tweets related with news titled, “Americans shocked at New Zealand’s move towards gun control”. They indicated that there are countries who actually care about the people safety rather than appeasing to the right-wing group. Last but not east is the orange cluster. Most accounts in this group questioned the international reaction towards the incident, comparing it with the Muslims terror attack in Israel which receive critics from across the globe. Some even argued that the media used the word “gunman” instead of “terrorist”. Overall, majority of Twitter users condemned the terrorist act at Christchurch. Besides, numerous users praise Jacinda Arden and the New Zealand government on the way they handled the crisis.